Address MiFID II Regulatory Technical Standards efficiently and cost effectively. In this new era of rigorous regulation, shorter testing windows, and constrained budgets, it is challenging to fulfill both business goals and regulatory requirements. 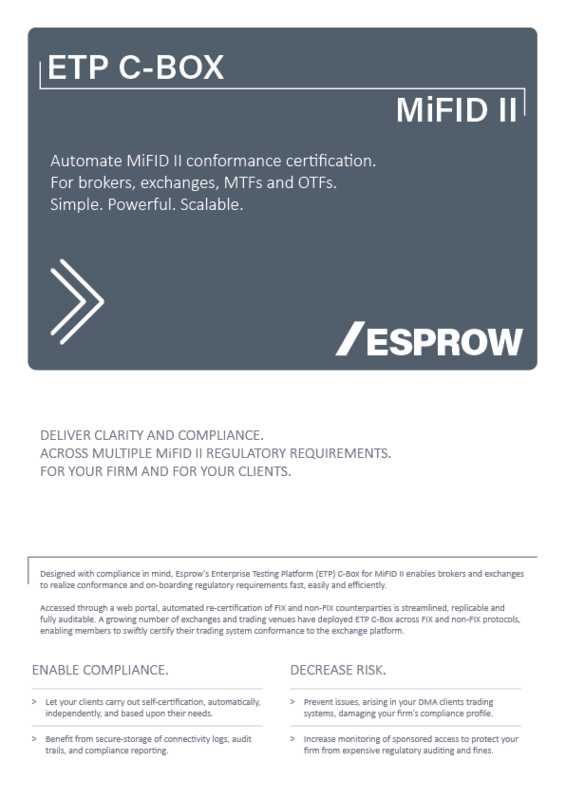 Esprow ETP provides a complete technology platform to address both, whether related to MiFID II technical standards, or to support your everyday business and technologies. ETP C-Box for MiFID II: automate annual certification of DMA and FIX counterparties under MiFID II RTS 6 and 7. ETP GEMS for MiFID II: automate testing of trading algorithms and systems under MiFID II RTS 6 and 7. ETP Studio: automate testing of trading systems under MiFID II RTS 6 and 7. All ETP components are tightly integrated and share their core technology. They are designed to fulfil the requirements of large enterprises and individual users. Discover how ETP C-Box delivers a ready-to-deploy technology to fulfil many MiFID II requirements related to certification of trading counterparties and members. Discover how ETP GEMS delivers a ready-to-deploy technology to fulfil many MiFID II requirements related to testing of algorithms and trading venues.